If you are just beginning to explore the world of food challenges and competitive eating, WELCOME to the community!! We are very excited that you are interested in competing in different eating events. There are over 3,000 food challenges throughout the world and there are different eating contests popping up all of the time too. 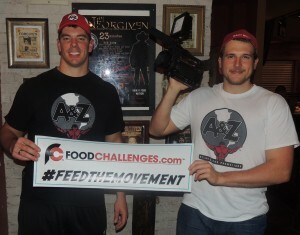 More and more opportunities will be created as we continue to #feedthemovement and increase society’s level of acceptance while building the popularity of food challenges and competitive eating. Hopefully you have a few favorite professional and competitive eaters that you follow, and thanks to FC.com you can now learn HOW they got to the level that they are currently at, and you can also learn WHAT you need to do to become an elite eater too. So that you don’t end up disappointed, please know before you start your journey that “Rome wasn’t built in a day.” You may have seen Joey Chestnut eat 69 hot dogs and bun in 10 minutes during the annual Nathan’s 4th of July Hot Dog Contest, but know that he was not able to eat that many when he first started. Back in 2005, he won his very first Nathan’s qualifier with just 20.5 hot dogs and buns, and then went on to finish 32 at the finals that same year, placing 3rd. Even with 32 in 10 minutes which is more than most people can eat in a day, that is less than half than he can eat now. Tiger Woods, one of the most dominant golfers to play the game, started as a young child by making a few simple putts. Serena Williams, one of the most dominate tennis players to play the game, did not start out as a World Champion. Lou Ferrigno, the legendary professional bodybuilder (and one of my heroes), was not born weighing 295 lbs and standing 6’4″ while having a size 34 waist. It took years of training and perfecting their game along with gallons and gallons of blood, sweat, and tears to build themselves into who they were at their peak. This same theory holds true in competitive eating too. The elite eaters in the sport today have spent years training and competing, while constantly trying to safely improve their abilities. You may have read somewhere that the legendary Takeru Kobayashi can drink 3 gallons of liquid in one sitting, but he was not born with that ability. He may be genetically gifted, but he spent years perfecting his game and training so that he could reach the level he did. The elite eaters of the sport are self-made through extreme effort, and not just born that way. 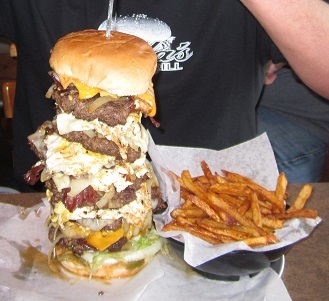 This towering burger is called The Stellanator and is located in Omaha, Nebraska of the USA at Stella’s Bar & Grill. There are six 6 ounce burger patties, 6 eggs, 6 pieces of cheese, 12 pieces of bacon, vegetables, and both buns are covered with peanut butter. The burger is delicious, and it is the 4th food challenge that I defeated back in 2010 on my birthday, with a time of 25 minutes. I had a rough night afterwards too while attempting to celebrate my birthday, mostly due to my body not being used to eating that much food at one time. Over 40 food challenge victories later though, I went back and smashed the exact same challenge in just 7 minutes and 26 seconds, and then was able to party like I hadn’t even eaten dinner. My body was now used to my new lifestyle. If you begin your career thinking that you will immediately be able to defeat professionals that have been competing for years, there is a high percentage chance that you will be disappointed and end up discouraged. If you decide to attempt a massive eating challenge that is just way too tough as your first challenge, there is a very high percentage chance that you will fail, and again end up discouraged. Every journey starts out with just a few small steps, so make sure to start slow and build gradually. The main purpose of competing in challenges & contests is to have fun, and it is not fun losing. Therefore, do not set yourself up to fail. Make sure to read and study all of the advice and secrets throughout the TIPS and STRATEGIES sections. Your favorite elite eaters have trained using very similar methods and strategies. The difference between you and them though is that they had to figure things out the hard way through the old method of trial and error. They did not have this website to help them when they were first starting out. Please make sure to take full advantage of this great resource. To go back and view other Food Challenges 101 articles, click here.